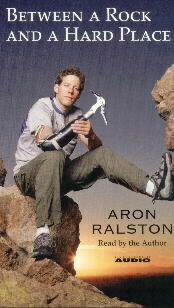 Aron Ralston was amazing long before he won fame out of potential death. After five years as a mechanical engineer, he abandoned that life to pursue his love of the outdoors. 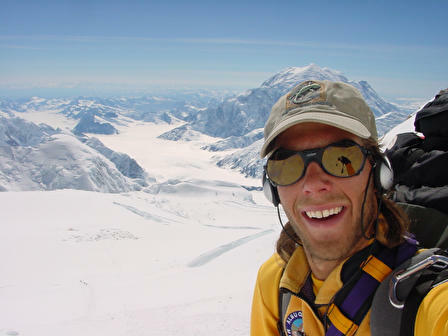 He will eventually finish climbing all 49 peaks in Colorado higher than 14,000 ft (4.2 km) in a few years. Fate delivered a blow few of us could overcome. A boulder pinned his right arm for five days (Saturday 26 April - Thursday 1 May 2003). With his time running out, he managed to sever his pinned arm and escape death. He modestly declines the name "hero", but isn't that what heroes are? Do they not overcome severe situations? In his case, he battled nature and death alone, but it does NOT diminish his courage! One final thought: he's a combination of intelligent and physical prowess. He finished first in his class for mechanical engineering, with a double major in French and a minor in music. Obviously, he has great intelligences in many fields: mathematical, verbal, musical, and especially physical. Just from his pictures, one can see he has charisma, and his ability to speak only proves it. Would I love to meet him! In the background is O Town's "I Showed Her", which was around at the time of the accident in Bluejohns in late April 2003. 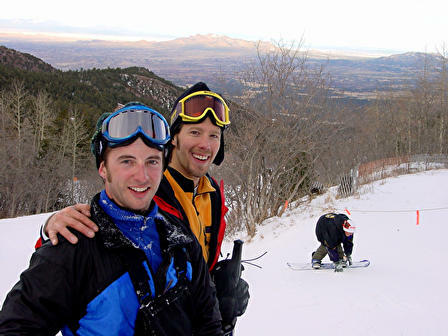 Dateline featured Aron Ralston at the site of Blue John Canyon where he almost died. It first aired on Friday, 10 September 2004. Some criticized his not wearing a helmet. Well, that's up to him, is it not? Aron's 28th birthday occurred at the taping, which means that it was on a Sunday, just like the day he was born! 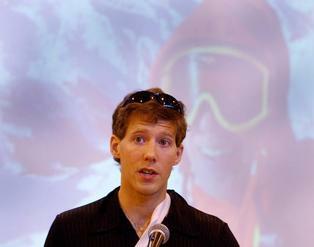 I came across this German explanation of how Aron Ralston saved his life. Top: With a plastic (or elastic) band, tied (himself) the mountaineer the upper arm off. Farthest right: By the amputation, were veins and arteries pinched off. Hence, the reason it took him an hour to saw off the forearm after he broke the radius and the ulna. 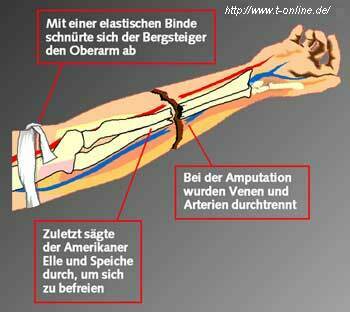 If one looks at the sling, one can see below that this diagram is quite accurate. ..."I want to talk with you today about three types of freedoms and corresponding responsiblities that you will encounter in the coming years. First and most important, is the freedom to define yourself and the responsiblity to do so with integrity. Second is the freedom to interact with others and the responsibility to treat others the way they want to be treated. (Note: the Platinum Rule) Finally, you will have the freedom to be happy and the responsibility to provide that opportunity for others as well. "First and foremost, you have a responsibility to yourself always to act with integrity, follow your passions, and overcome your fears. Don't let other people tell you who you are, don't settle for their expectations and dreams for you; you must define yourself, you must great your own expectations and dream your own dreams...my decision was the result of a longtem and ongoing process of discovery -- a process we each must undergo. "My recent experience in Blue Jean Canyon is an adjustment in the pursuit of my dreams, but there is no failure in my situation...I am continuing my pursuit of my dreams, my lifestyle. Again, let me stress that the only person who can hold you back is you. Don't be attached to the pathway, it is merely a starting plan to flexibly adapt -- follow it as you create it to negotiation obstacles along the way."